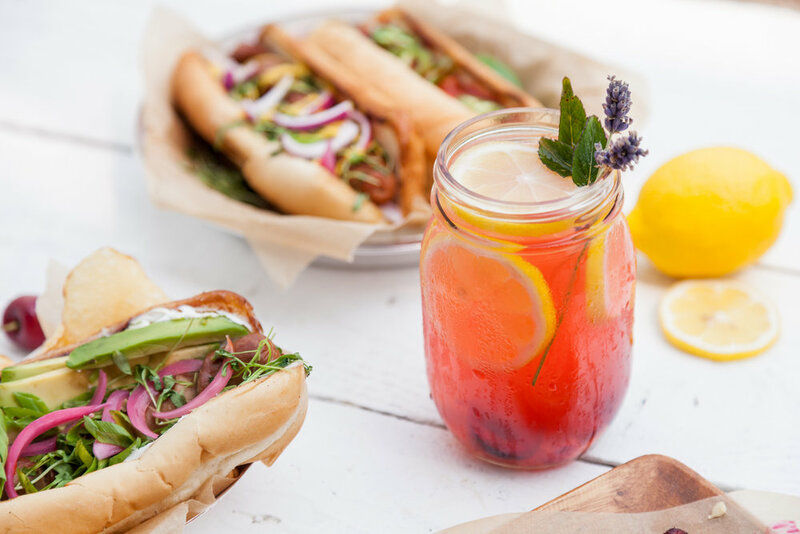 gourmet hot dog & lemonade party with amy johnson! a few weeks ago i had the pleasure of working with amy johnson, an awesome food photographer in seattle! i dreamed up some delicious gourmet hot dog ideas and extra juicy & refreshing cherry lemonades. it was a super hot day so this summery picnic scene was just perfect. spiral hot dogs, at that! have you done this before?? it's truly the ideal hot dog experience. here is a youtube video that helped me achieve this in the past. grilling them spiraled creates wayyy more crispy surface area on the hot dog while creating gaps (aka condiment treasure troves) throughout. the condiments get tucked away instead of sliding around all over the top of the hot dog. huzzah! our cherry lemonades were brimming with flavor - fresh chopped ginger, peach slices, fresh red cherries & cherry juice and extra lemon, of course! toppings on the spiral dogs: cream cheese, sriracha, pickled red onions, avocado, yellow mustard, ketchup, red onion, green onion, yellow onion, micro greens (cilantro! ), and sliced jalapeño! and kettle chips for crunch. always the crunch factor. don't forget to toast that bun. i'm really clinging on to the tail end of summer here, folks. check out amy's lovely photography work and her post about our photo shoot here! food styling, prop styling, & recipes by me.